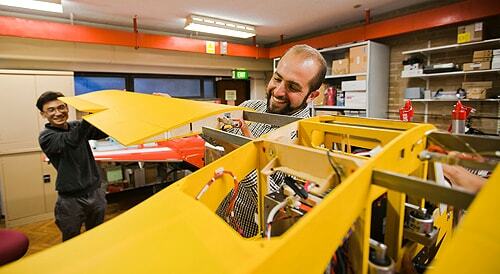 Salah Sukkarieh (centre) from the Australian Centre for Field Robotics working on one of his projects. As robotic systems become more intelligent, more flexible, more autonomous and more adaptable to their surroundings, international robotics experts are gathering at the University of Sydney's Great Hall to discuss their future. One of the world's most prestigious meetings in the field, the 'Robotics: Science and Systems' conference, commencing 9 July, is being hosted by the Australian Centre for Field Robotics (ACFR) in the Faculty of Engineering and Information Technologies. Associate Professor of Mechatronics and co-Chair of the conference Dr Stefan Williams says robotics is at a pivotal point and the 'Robotics: Science and Systems' conference will bring together visionaries and researchers working on the algorithmic and mathematical foundations of robotics applications, analysis and systems of the future. "Some of the leading thinkers in the field of robotics from all over the world will cover topics as diverse as medical robotics, underwater robotics, navigation and planning, and humanoid robots and their applications in domestic environments," Dr Williams says. "It will be a valuable opportunity for leading experts in different areas of robotics to cross-pollinate ideas and to find out about the latest theoretical developments and advancements in robotics applications and systems." The ACFR is one of the largest robotics research groups in the world, with a team of 60 engineers, scientists and technicians and more than 50 PhD students. "Australian researchers are among the world's leaders in robotics, and the choice to hold the prestigious conference here at the University of Sydney reflects the importance of the work we're doing," Dr Williams says. The ACFR contributes to a broad range of fields in robotics, with recent projects including the use of aerial imagery to detect fire ant mounds and map large rural areas, archaeological surveys of shipwreck sites in the Mediterranean and projects with Qantas related to fuel prediction and payload management. The five-day program includes invited talks from international keynote speakers such as Anders Sandberg from the Future of Humanity Institute at the University of Oxford and Zoubin Ghahramani, Professor of Information Engineering at the University of Cambridge.